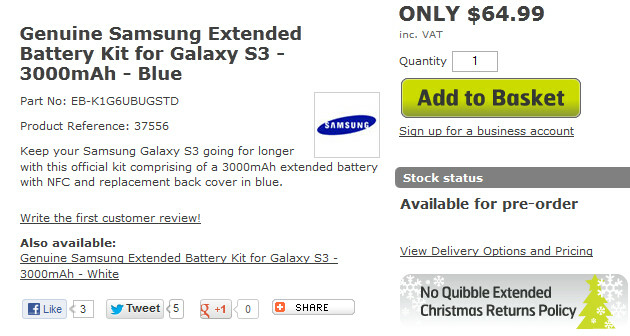 Pre-order a Samsung extended 3000mAh battery for the Samsung Galaxy S III in the U.K. The 2100mAh battery that comes with the Samsung Galaxy S III might not provide enough battery life for many power users. Samsung is finally ready to ship out an extended 3000mAh cell which can be pre-ordered in the U.K. from Mobile Fun. The battery is priced at 39 GBP ($65 USD) and the capacity on the cell compares to the 3100mAh cell on the Samsung GALAXY Note II. The extra 900mAh should provide at least a couple of extra hours of use for the phone's user. You can pre-order an extended cell for your Samsung Galaxy S III in the U.K. The extended battery kit includes the actual 3000mAh cell, and a special back cover designed to accommodate the larger battery. The back cover includes an embedded NFC chip and is available in blue or white to match the color of the phone. The extended battery will make your phone heavier, although the Galaxy S III isn't a heavyweight to begin with. While the extended battery kit isn't available yet in the U.S.,we feel comfortable predicting that it will eventually make the journey over the Atlantic. After all, there are power users in the U.S. who would give up almost any body part for additional battery life on their Samsung Galaxy S III. How much is the added thickness? That's the only information I'm interested in. With this extended battery, the S3 will finally last as long as the iPhone5. Well...maybe? http://blog.gsmarena.com/google-nexus-4-battles-through-our-battery-test-see-if-its-better-than-the-galaxy-nexus/ http://www.anandtech.com/show/6440/google-nexus-4-review/2 edit: click on expand to see all the phones including the S3. What did your link prove? You do realise that the iPhone 5 only beat the s3 at web browsing in the gsmarena link with the galaxy s3 having a much greater talk time and equal video time. Also contemplate this.. After a year of owning an iPhone5 and a s3 their batteries will have gone through potentially 300 cycles. This has a major effect on the battery life and the s3's battery can simply be repalced or upgraded in this case. Good point you're making here. How I wish HTC were smart enough to realise this too. It explains why they are doing so poorly compared to Samsung today unlike 2 years back with the desire series without the unibody ideas that's got so excited to compromise design over functionality. So basically a phone with a smaller display and lighter multi-tasking abilities will beat out a larger phone doing more... only in web browsing. Shocking!